Officials have temporarily suspended water shutoffs, and activists are working to create permanent protections for low-income families. The austerity agenda as it plays out on the ground in American cities is often so relentless in demanding cuts in public services that it is easy to imagine that it cannot be upended. And that goes double for Detroit, where Michigan Governor Rick Snyder has given his appointed “emergency manager”—rather than local elected officials—control over critical decisions regarding city operations. But that does not mean that austerity always wins. 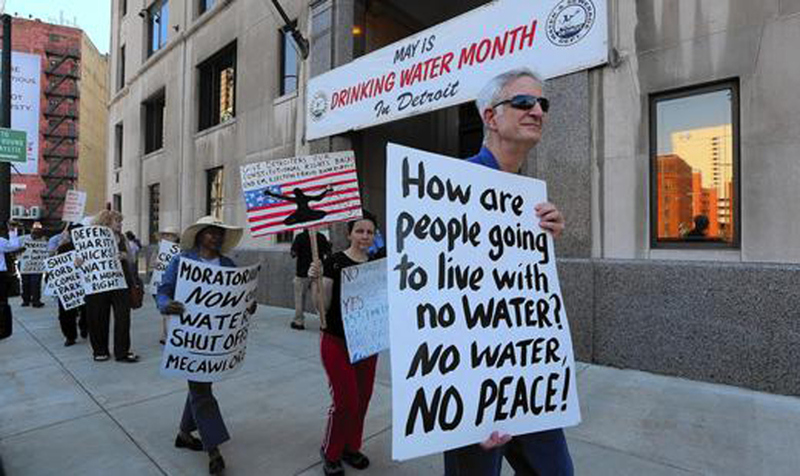 Last week, protests by Detroiters and allies from across the country focused local, national and international attention on the Detroit Water and Sewage Department’s program of shutting off water service for thousands of low-income families that have fallen behind in paying bills. On Friday, religious leaders and community activists were arrested after blocking trucks operated by the private contractor that was responsible for the shutoffs. At the same time, a mass march filled the streets of downtown Detroit with protesters arguing that the most vulnerable citizens of a city hard hit by deindustrialization ought not be further harmed by the loss of a basic necessity that the United Nations deems a human right. There is actually a great deal that must be done. “The city of Detroit’s fifteen-day moratorium on water shut-offs, announced [Monday] nearly four months after the shut-offs began, is welcomed but inadequate relief for a city in which thousands of residents either have lost or face the continuing threat of losing access to water,” announced the ACLU of Michigan and the NAACP Legal Defense Fund, both of which have argued that the water shutoffs violate both civil and human rights. That focus on civil and human rights has been central to what has developed into a powerful challenge to to a specific manifestation of austerity in Detroit—a challenge that could serve as a model for other fights on the local, state and national levels. That message echoed the demands of local groups such as Michigan Welfare Rights Organization, People’s Water Board and the Michigan chapter of the National Action Network and Moratorium Now!—all of which are supporting the lawsuit—for an end to the shutoffs that have left some families without water while forcing others to sacrifice other necessities in order to pay what critics decry as excessive water fees. Making that connection is important. What is happening in Detroit is part of a much broader scenario, in which decisions about how to pay bills and cover costs are too frequently made with little attention to human needs. The good news is that when those human needs are brought into focus, the policymakers start to pay attention—and sometimes, they start to change the policies.